On July 23, the U.S. Department of Transportation's Pipeline and Hazardous Materials Safety Administration released proposed rulemaking that aims to improve the safety of rail transportation of flammable materials, particularly crude oil and ethanol. The agenda for the 2015 National Advanced Biofuels Conference & Expo has been released. The Oct. 13-14 event, located in Minneapolis, Minnesota, will focus on next-generation biofuels technology integration opportunities for existing biofuel plants. East Kansas Agri-Energy LLC has announced its intent to integrate renewable diesel production at its ethanol plant in Garnett, Kansas. 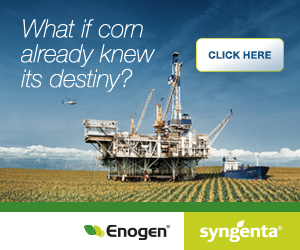 The fuel will be made from the corn distillers oil already produced at the plant along with other feedstocks. The European Union has filed its annual biofuels report with the USDA Foreign Agricultural Service's Global Agricultural Information Network, reporting that the European Commission aims to reach an agreement on future biofuel policy by October. Agriculture Secretary Tom Vilsack recently announced that the USDA has selected 36 energy facilities in 14 states to accept biomass deliveries supported by the Biomass Crop Assistance Program, which was authorized by the 2014 Farm Bill. With corn prices the lowest in years, the question arises whether farmers who invested in ethanol plants are finding it an effective hedge. Retired Iowa State University ag economist Don Hofstrand analyzed the question in a recent newsletter. Aemetis Inc. has announced that the company received a $3 million matching grant award from the California Energy Commission Alternative and Renewable Fuel and Vehicle Technology Program to support a sorghum ethanol project. Legislation recently introduced in the U.S. House of Representatives would provide automakers an option to reduce their corporate average fuel economy (CAFE) standards by warranting at least half the vehicles they manufacture for alternative fuels. Montana Microbial and the USDA Agricultural Research Service are developing an enzymatic treatment for barley that produces a high-value protein concentrate, describing ethanol as the process coproduct. A Union of Concerned Scientists report estimates the U.S. agricultural industry could sustainably provide up to 155 million tons of crop residues and 60 million tons of manure annually by 2030 for use as feedstock to produce fuels and electricity. The U.S. Department of Energy has announced it will award up to $4.5 million in funding to expand the use of alternative fuels through the Clean Cities program, which works to decrease the use of petroleum in transportation. Ethanol produced in the United States has been the most economically competitive motor fuel in the world over the past four years and has played an important role in reducing consumer fuel costs, according to a new analysis. Ethanol advocates can expect an agenda including notable speakers and timely topics for the upcoming 27th annual ACE Ethanol Conference, August 4-6. Lesaffre has announced the acquisition of the start-up Butalco, a research company focused on yeast technology and the development of yeast strains for second generation of biofuels and bio based chemicals. A Purdue Research Park-based company whose one-step, patent-pending technology could improve the efficiency of alternative fuels and the production of fragrance products has received funding from the National Science Foundation. The Renewable Fuels Association will partner with the Sturgis Buffalo Chip campground to host the 74th annual Sturgis Motorcycle Rally set to take place Aug. 4-10.